The iOS 5.1 update, released Wednesday amid a slew of product announcements from Apple includes a small slate of fixes and improvements, a handful of new features, and—for some AT&T subscribers, at least—a new 4G cellular service label in the status bar. It’s that new cellular service label that’s causing the most confusion (and, in some cases, amusement) for AT&T’s iPhone 4S customers. While an iOS update could, theoretically, make under-the-hood improvements to facilitate slightly faster cellular data speeds, obviously no software update will affect your iPhone’s built-in antennae. So what prompted the 3G to 4G change for the AT&T iPhone 4S, and what exactly does it mean? When Apple senior vice president Phil Schiller first unveiled the iPhone 4S in October 2011, he said that the then-new phone’s 5.8Mbps upload and 14.4Mbps download speeds matched what Apple’s competitors called 4G, but added Apple was “not going to get into a debate about what’s 4G and what isn’t.” It appears that perspective has changed. 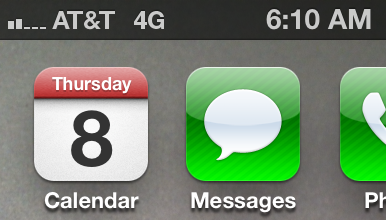 The 4G label in iOS 5.1 instead reflects AT&T’s perspective, namely that the carrier’s HSPA+ network (also known as Evolved High-Speed Packet Access) qualifies as 4G technology. Carriers tend to refer to both HSPA+ and LTE—the cellular network technology built into the new iPad—as 4G, though the inner workings of the technologies are vastly different. Thus, because the iPhone 4S on AT&T’s 3G network can achieve what both Apple and the carrier describe as 4G-style speeds, the status bar now shows the 4G label whenever you’re connected to AT&T’s HSPA+ network. Again, though, your iPhone 4S isn’t any faster than it was last week; this label change falls somewhere between semantics and marketing. iOS 5.1 also adds back a feature that had gone missing in iOS 5: a toggle for turning on and off 3G data. 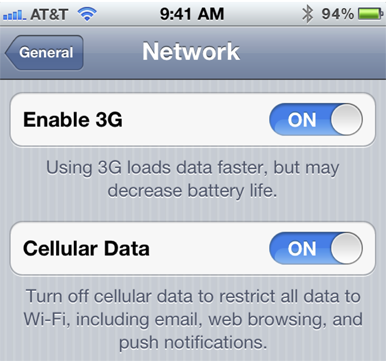 That reinstated toggle, however, only appears for customers using 3G networks with their iPhones—and it doesn’t appear at all for AT&T customers using the 4G label-sporting iPhone 4S. As it stands now, if your phone newly reports itself as using a 4G network, you don’t get a switch to turn on and off 3G (or 4G) access; you only get the standard Cellular Data switch. AT&T iPhone customers using iPhones older than the 4S, and some iPhone 4S customers using other 3G networks, can once again use the 3G switch to force their devices to use slower networks—an option that can help extend battery life if you don’t mind sacrificing data speed. Other new features included in iOS 5.1 include a new camera shortcut on the lock screen, added Siri functionality for Japan, increased cellular download limits, a slightly tweaked version of the Location Services compass icon in the status bar, the ability to delete Photo Stream photos, and improvements for battery life and call quality.